Photo: OC junior Cameron Brown shot a 5-under 66 on the opening day of the South Central-West Super Regional. 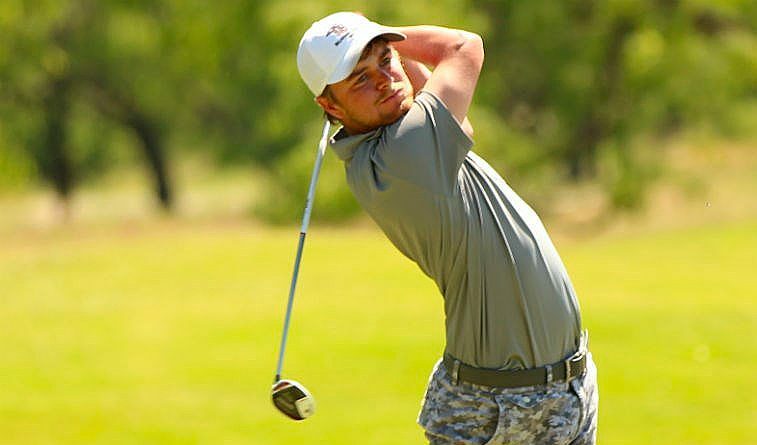 AMARILLO, Texas (May 7, 2018) – Hot and windy conditions didn’t seem to faze Oklahoma Christian on Monday during the first round of the NCAA Division II South Central-West Super Regional at La Paloma Golf Course. OC successfully dealt with temperatures in the 90s and winds gusting to near 40 mph on the links-style course and poured in 19 birdies and two eagles, putting the Eagles in second place in the 20-team field at 290. The Eagles, who sat atop the team leaderboard for much of their afternoon round, are only four shots behind the leader, No. 20-ranked St. Mary’s (Texas). Right behind OC are Colorado Christian at 291 and California Baptist and No. 15-ranked Chico State (Calif.) at 292. Thirteen teams are within 13 shots of the lead. The top five teams in the three-day, 54-hole event, along with the top three individuals not on one of those five teams, will advance to the NCAA Division II Championship later this month in Muscle Shoals, Ala. OC is seeking what would be its second Division II Championship appearance in three years. In the individual race, OC junior Cameron Brown was second after shooting a 5-under-par 66 on the 6,805-yard course. Brown, from Jacksonville, Texas, led the 108-man field with seven birdies. He held the overall lead twice during his round. The latter time came after his seventh birdie at No. 17 before he closed with a bogey at No. 18. Brown had an impressive run of birdies on the front nine, with four in five holes, to quickly move into contention. He will enter the second round trailing Eric Valenzuela of St. Mary’s by one shot. Brown wasn’t the only OC player to putt well early on Monday. Garrett White, coming off an individual Heartland Conference title, was 3-under over his first six holes, with three birdies before an eagle at the par-5 No. 6. He didn’t have another birdie the rest of the way, though, and eventually shot 73. That put him tied for 23rd. Also shooting 73 was freshman Andres Brictson, who had five birdies in a six-hole stretch, starting on No. 8. It was interrupted only by a double bogey at No. 12. Junior Grady Neal had an eagle on the par-5 No. 2 and three birdies, but also had nine bogeys (two of those double bogeys) in an up-and-down round. Neal shot 77 and was tied for 63rd. Fellow OC junior Juan Pallach added one birdie en route to a 78 that put him in a tie for 74th. The Eagles will play in the morning round on Tuesday, starting at 8:20 a.m. OC will be grouped with Arkansas-Fort Smith and Sonoma State (Calif.) for the second straight day. Freshman Aidan Gavey sits in sixth on the leaderboard and the Rogers State men’s golf ranks 17th out of 20 teams after a first round score of 309. Gavey, a freshman from Caledonia, Ontario, fired a first round score of 1-under-par 70 to pace the Hillcats and rank sixth overall in the field of 108 golfers. He came out blazing with four birdies in the first six holes to get to 3-under-par. After his second bogey of the front nine, Gavey was at 2-under through nine. On the back nine, he started with three bogeys in a four-hole stretch; however, he was 3-under on No. 16 and 17 with a birdie and eagle, respectively. The freshman ended with a double bogey to fall back to 1-under-par and a tie for sixth with the 70 to begin the tournament. Senior Alex Marsh shot 77 and freshmen George Burnett, Gonzalo Chaves and Luke Palmowski all shot 81.